For a nation of more than a billion cricket lovers, who have grown up watching the game with great gusto, we have, inadvertently, shown a lop-sided interest towards batsmen. Not going through the pain of listing them all down here, as we have had many of them, who have dominated our cricketing conscience so far and continue to do so. 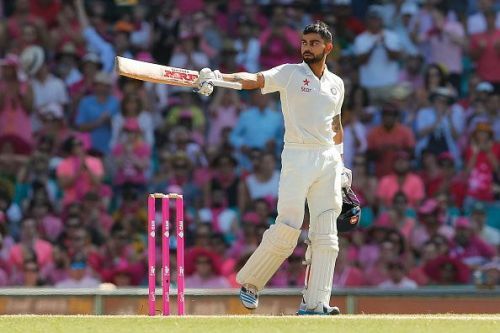 Virat Kohli has added a new dimension to that consciousness, he has used his high-levels of fitness to bolster his temperament, talent, and performance and in the process, has changed the way cricket is played in India or in the sub-continent for that matter. While he ticks all the boxes for a typical Indian batting great technique-wise, he also has quite remarkably managed to infuse the ‘fitness’ angle into his game, which was not adequately stressed upon by the cricketers of the previous era, especially the sub-continent cricketers. Today, Virat Kohli epitomizes almost all those qualities that we generally associate with a high-performance athlete. Talent, passion, aggressive intent and, above all, fitness are the four pillars on which his game firmly rests. Virat Kohli is an amazingly skilled batsman, he has quite exceptionally so far capitalized on his batting abilities and has managed to single-handedly win matches for India. His knack for timing the ball and placing them through the gaps is quite remarkable, those sumptuous drives through the covers almost invariably past the fielders are a feast to the eyes, for most cricket-buffs. A natural derivative of his talent is his game-awareness, his ability to read situations well and structure his game accordingly which has resulted in a staggering number of centuries while chasing an ODI score. The amount of cricket that is being played today is frenetic. Cricketers are increasingly complaining about tight schedules and excessive workload, which is taking a toll on their desire to performance consistently, but not quite for Virat Kohli: he plays all the three formats for India and does it with equal aplomb. To step on to the field, each and every time with an equal amount of intensity and hunger to perform is what makes Virat Kohli a cut above the rest. The most important paradigm shift that we have witnessed in the last decade and a half is that the Indian team has been able to instill in itself a sense of fearlessness under the leadership tenures of Sourav Ganguly and MS Dhoni, Virat Kohli has just taken it a multiple notches higher. The remarkable quality of countering every situation and opposition with a brand of cricket that is being increasingly defined by his own personality has worked wonders for the Indian team so far. That determined look on his face, while operating in the field is just many of the positive off-shoots that the aggressive intent has brought to his game. Last but not the least, Kohli has changed the way ‘fitness’ is perceived today. It is not just about hitting the gym every day and following set work-out routines: for the first time we are seeing diet and other radical lifestyle changes play a crucial role as parameters for cricketers to reach the required levels of fitness to compete in international cricket. With the ‘fitness factor’ kicking into the game, cricketers today are striving harder to become more complete athletes and are continuing to push boundaries in this area of the game. Kohli is being emulated by both young and experienced cricketers today in India and elsewhere for his mastery over all the three formats and his fitness has played the most critical role in helping him reach there. The defining moment was the 2014-15, Border-Gavaskar series in Australia, when he was handed over the Test captaincy for the first time. In hindsight, it was not really a 'baptism by fire' moment for him, although India lost the series, he excelled personally and displayed a giving-it-back kind of attitude, which had rattled the Australians for sure. The temperament shown by him has truly marked the inception of a new era for Indian cricket. Since then, the other sub-continent teams who have played in Australia have managed to show the same kind of belligerence and compete against the mighty Aussies. Virat Kohli has been imperious so far, the statistics that he has managed to churn out are quite astounding and well-known, so let the numbers take care of themselves, while he keeps piling them on, with those delectable looking push-drives through the covers and yes, the Kohli era has just begun. Opinion: The tale of India’s Dark Knight — Pujara, and why Superman Kohli needs and deserves him! What was different for Team India in Australia as compared to England or South Africa?